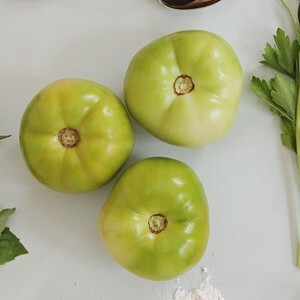 Green tomatoes are simply tomatoes that are not fully ripened (they can be any variety). These gems are typically a fall treasure as they must be pulled from tomato plants that have reached their peak of the summer. They are rich in antioxidants as well as B vitamins. Green tomatoes are not as juicy or sweet as their fully developed versions, but they are particularly delicious when fried (as in our Fried Green Tomatoes with Roasted Peppers Salad & Chevre).